What's your RStudio pane layout? 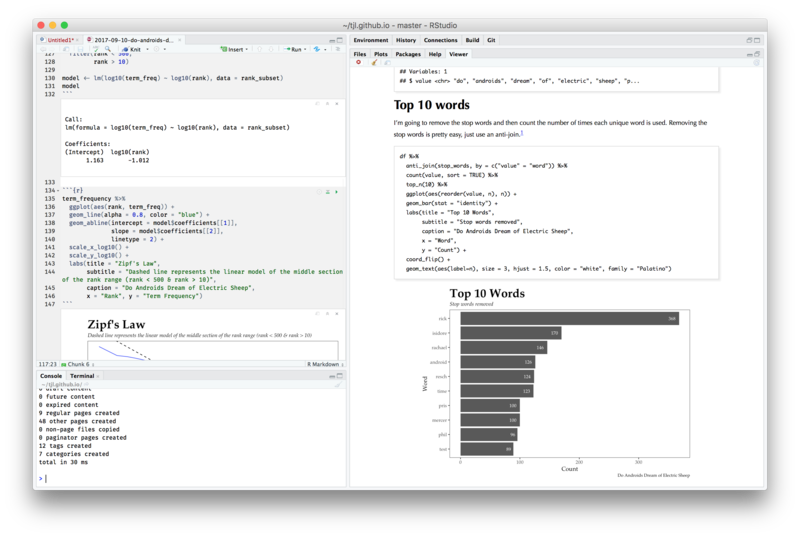 Even though I have been using RStudio since it's release, it's only been recently that I've explored changing the default pane layout. I've seen a lot of screenshots in the wild with the console and source panes on separate sides and now I've become a big fan of that layout. Anyone else want to share their preferred layout and other tweaks that optimize your RStudio sessions? I'm one of those people with my panes set up how you mentioned. It makes it so much easier to work with my console and source code at the same time. if you use .RMD a lot it'll help to download the R addin remedy. Which makes typing markdown a lot easier. I've also mapped the knit command to a button on my mouse so I can knit documents when I need to use the mouse. In the past, I have used a second screen in portrait mode for the console, but my desk does not have the room. Keeping it and the editor separate is advantageous. Pop-out frames can be great too, especially for plots. I don't change the theme but I do keep a console-script-plots-environment [clockwise from top left] order. I also really enjoy keeping a visible line at the 80 character mark in my script, to keep readability in mind when writing long things. I have the source pane top left, but I make it full screen. Below it, minimized, is history and viewer. Top right is console, bottom right is everything else. I primarily work on a widescreen 27" display, so vertical space is a premium and horizontal space is plentiful. 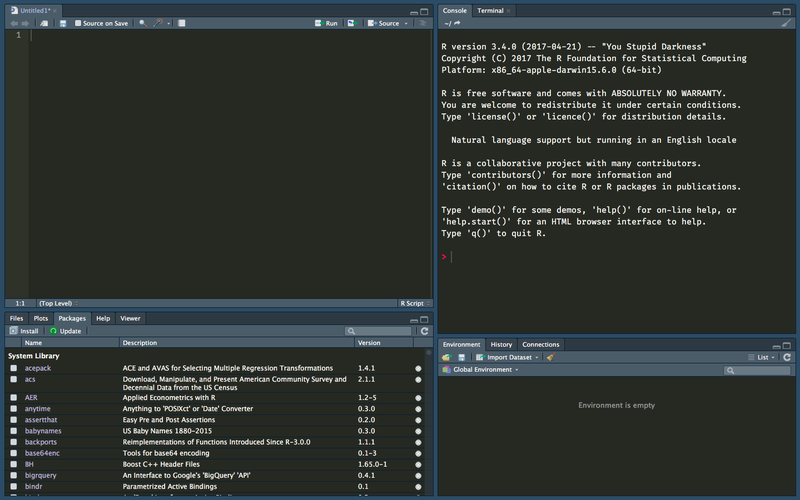 I'd really like more flexibility in pane layout. Ideally a three column layout with source and console taking one column each, and everything else taking the last column. My pane layout. But for classes I change them to the standard, that my students may not get confused. Mine hasn't changed much. I like the 80 character limit and a big viewer pane. 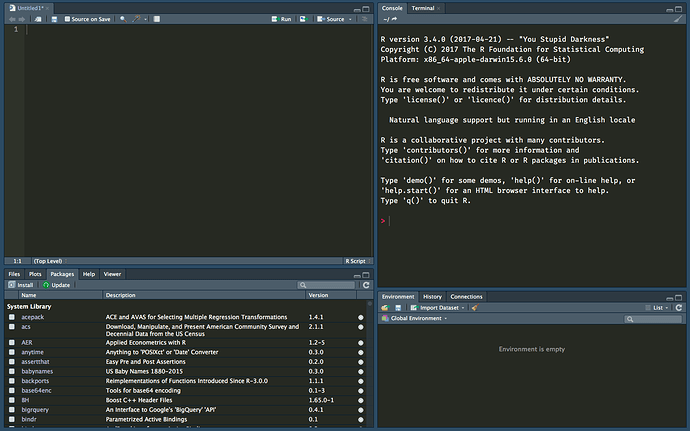 What's the best way to oraganize your RSTUDIO panes? 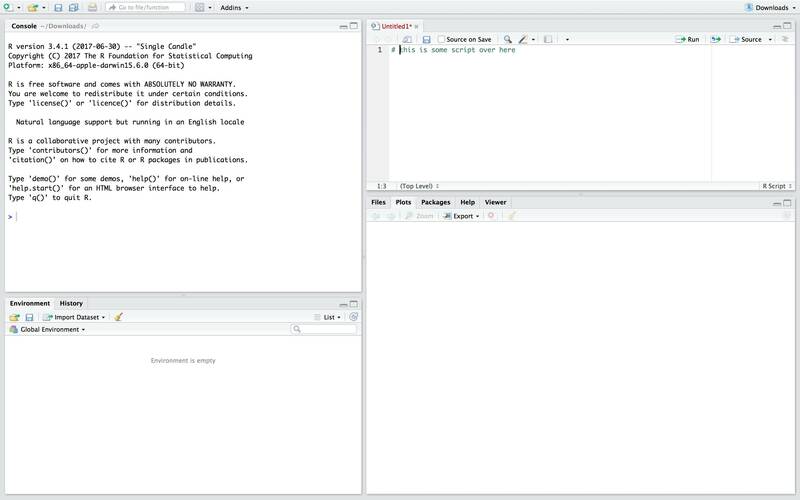 My to everyone for sharing their RStudio setups! This gives me a lot of ideas to try. I often view the help tab in full vertical space especially when writing packages so I like having both that and the files fully stretched out. And tearing selected files out to my second monitor makes it a lot easier especially when developing shiny apps. Strange... Looks like a bug worth the separate issue. You say I should open a discussion? I haven't search much about it. 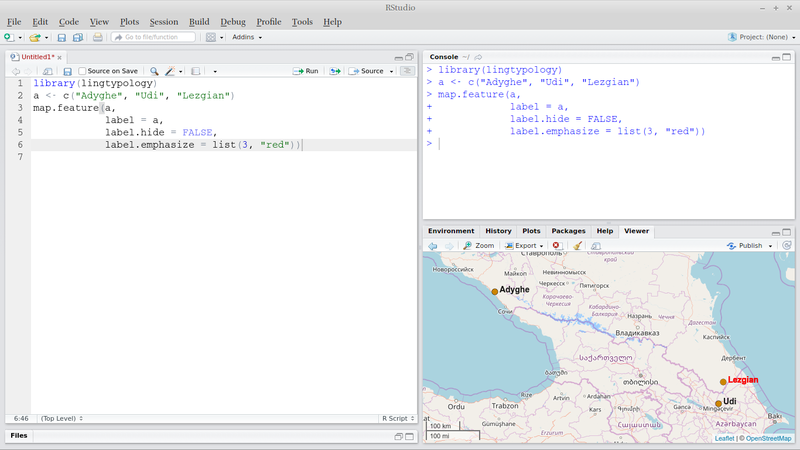 And true, sometimes I have some problems with this part of RStudio... But I'm sure it could help somebody, if you'll describe your problem in different topic, printscreening every step. I like having a large plot panel so I basically put History,Connections and Packages on the RHS bottom and hide that part, so half of my screen is Environment/Files/Plots/Help/VCS and Viewer. I keep the LHS untouched, with the script at the top and the console at the bottom. But I came here because I was looking for a solution because recently the layout keeps resetting itself. Have you found the same problem? Should I post a new topic about this? Edit: a quick update if you are here because of pane layout problems, this has been discussed in Windows Pane Layout Breaks Under Certain Combinations (I couldn't find it because I was looking for "paneL layout" instead of "pane layout").